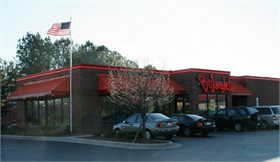 Wilson, NC Bojangles'® Tands, INC. Store #18 - Bojangles'® / Tands, Inc.
Bojangles’® is proud to serve Wilson, NC with our three locations! We love being a part of what makes Wilson, NC great. Bojangles’® is a favorite of Wilson locals. Our delicious Bojangles’® menu, with crispy fried chicken, flaky biscuits and boldly tasty fixin’s has just the flavors you crave! Bojangles’® in Wilson, NC is located just off of 95, making us an ideal rest stop for travelers. For breakfast, lunch and dinner, Bojangles’® has the food you crave at prices you’ll love!